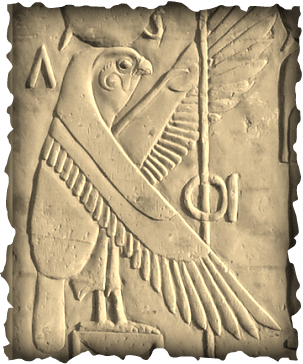 Falcon's head with the crown of Upper and Lower Egypt or the solar disk, squatting falcon, lion, or hawk with a lion's head. God of War who battles with Sutekh. Ra bending the war in his favor turns him into a solar disk enabling him to blind his enemies and win the war. Thus he is known as Heru-Behdety.